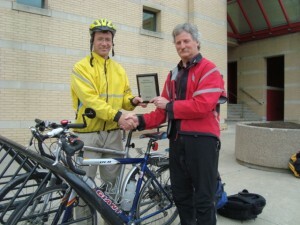 The City of Mississauga created the Phil Green Recognition Award in “in recognition of the outstanding work done by Mr Phil Green in promoting safe cycling and sustainable transportation in Mississauga”. 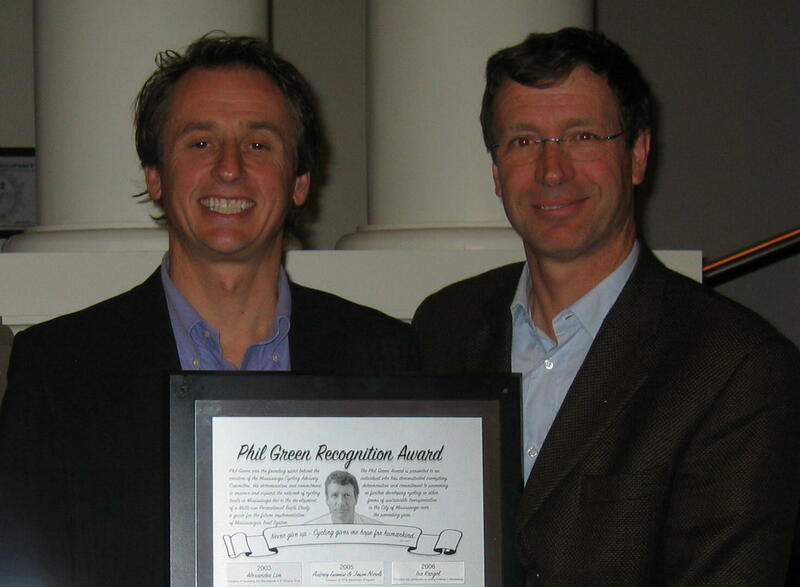 The Phil Green Recognition Award is presented annually by the Mississauga Cycling Advisory Committee to a person or persons who have demonstrated exemplary effort to the cause of promoting or furthering cycling or other forms of sustainable transportation in the City of Mississauga over the preceding year. The award is presented annually to deserving Mississauga volunteers. 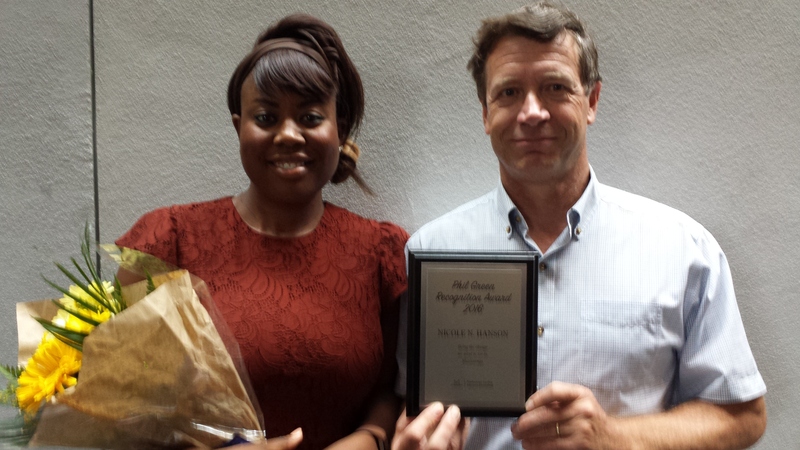 On September 13, 2017 Mississauga City Council awarded Nicole Hanson the 2016 Phil Green Recognition Award. The Mississauga resident is a strong advocate for active transportation in the city. 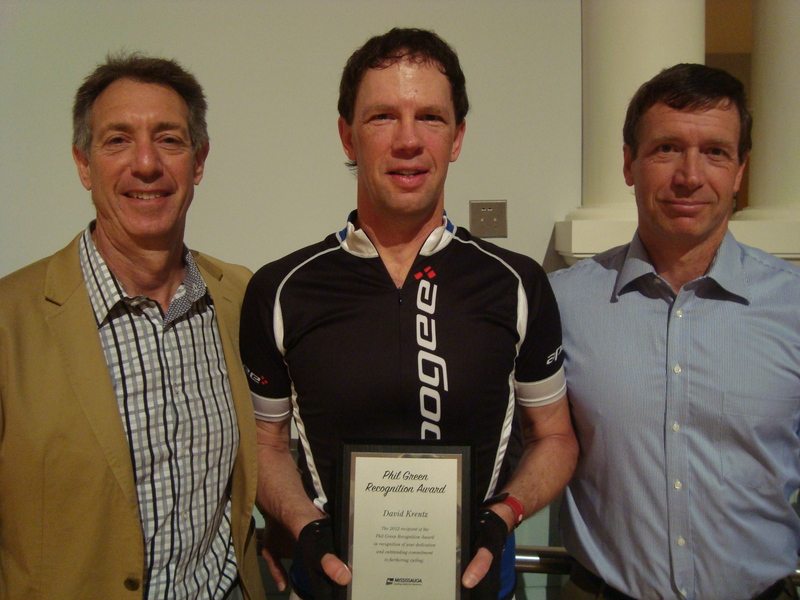 The Phil Green Recognition Award is presented annually by the Mississauga Cycling Advisory Committee (MCAC) to a person or persons who have promoted and furthered cycling or other forms of sustainable transportation. Morris explained that Hanson can be seen riding her commuter bike along the Lakefront Promenade and is extremely passionate about furthering active transportation options in the Lakeview and Cooksville neighbourhoods where she grew up. 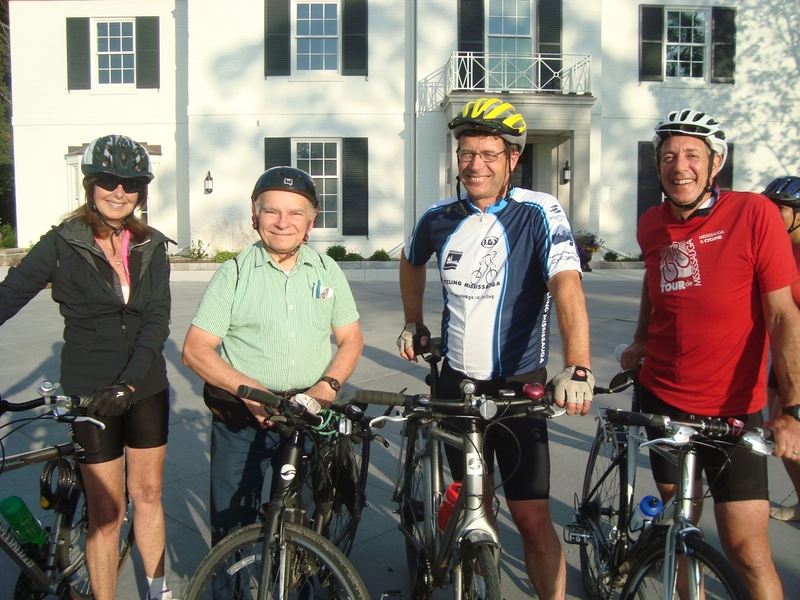 Frank Toth (second from left) won the award because of his pursuit and dedication to active living, especially among seniors. David Krentz, a Mississauga resident who integrates cycling into his personal and professional endeavours, received the 2012 Phil Green Recognition Awardfrom the Mississauga Cycling Advisory Committee (MCAC) for his strong advocacy for cycling in the community. The Award was presented at Council on Wednesday, June 19, 2013 with members of the MCAC in attendance. 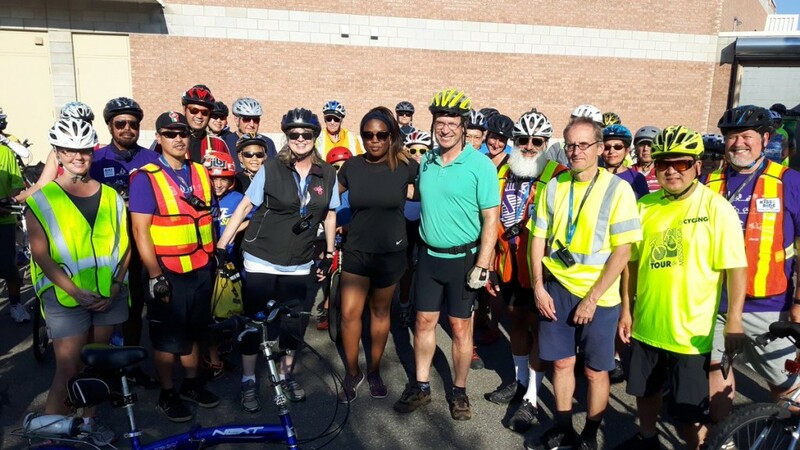 “Dave Krentz is an active advocate for cycling in Mississauga and his enthusiasm for cycling is recognized locally and beyond the City’s borders as he continually promotes ‘green’ modes of travel,” said Jeff Wachman, chair of the MCAC. Krentz has been a cycling enthusiast for 30 years. In the mid ‘80s his interest for road racing flourished as part of the Mississauga Cycling Club and today he’s affectionately known as ‘the bike guy’ in the Port Credit area where he rides his bike as a natural part of his everyday life. Krentz is also a consultant who supports small businesses in promoting cycling as an alternative mode of transportation to the car. The 2011 winner was George Douzenis, Mississauga resident and teacher at Glenforest Secondary School. George Douzenis (right) and Phil Green. The 2010 winner was Mr John Sabiston, P.Eng. Mr Sabiston was formerly chair of the Mississauga Cycling Advisory Committee and served on it from its inception in 1994 until 2009. The 2008 winner was Mr Jeff Rushton. Jeff Rushton is founder of Coast-to-Coast Against Cancer, a charitable organization that raises funds so that children with cancer can go to camps. Ted Ho was an active volunteer with the Mississauga Cycling Advisory Committee who died tragically in a cycling accident in Mississauga. The award was presented post humously. 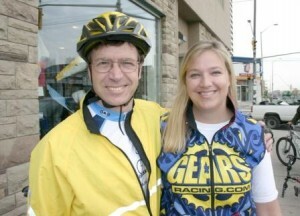 Ira Kargel is co-owner of Gears bike shop in Port Credit and has been actively involved in promoting cycling for many years. Aubrey Iwaniw and Jason Nicols were the 2005 winners for their work in promoting cycling at the University of Toronto in Mississauga.